I was at his bedside when he died. I called him Tūtūpa – a blending of the Hawaiian word tūtū for “grand” and the English word pa for “grandfather” as in grandpa. Actually, we all called him that – my cousins, aunties and uncles and others in our immediate family. He was simply known at Tūtūpa. He raised me from the time I was three years old until his death. He died when I was fourteen. I remember the early evening when we gathered around his bed. He had been ill for some time. Shortly after it was determined that he took his last breath, one of my aunties began wailing. Her uwē – her weeping and mourning - was loud and forceful. It was almost frightening. It would not be until years later that I realized such wailing was a familiar practice among our Hawaiian kūpuna or ancestors. Despite her uwē, it did occur to me at the time that death had freed my Tūtūpa from his pain and suffering. Still, my auntie’s lament caught me by surprise. But aside from my own momentary distress, what I remember most that early evening was the washing of his body. The washing was a part of the preparation for his burial that would soon follow. It was a simple act but one filled with love and compassion. Our reading from The Gospel According to John prepares us for Jesus’ final entry into Jerusalem and the story of his being washed and anointed for burial. 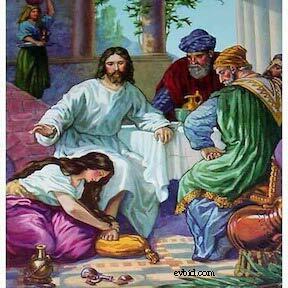 Jesus makes the statement that what Mary did in anointing his feet with perfume and wiping them with her hair was “for the day of my burial” (John 12:7). It may not have been Mary’s intention to anoint Jesus for burial. But her act of hospitality was filled with love and gratitude to Jesus (Preaching Through the Christian Year C, Craddock, Hayes, Holladay & Tucker, Trinity Press International, Harrisburg, Pennsylvania, 1994, page 164). While we see Mary’s love for Jesus, we also recognize the foreshadowings of Judas’ betrayal and the death of Jesus. It is Judas who is critical of Mary’s action, insisting that “it was an unnecessary waste of what could have been put to better use feeding the poor” (“Reflections on the Lectionary,” Justo L. González, Christian Century, March 13, 2019, page 19). But the passage explains that Judas’ is not critical of Mary out of any concern for the poor but because he is “a thief”; more concerned about money. Still, Judas does have a point. What Mary has done seems like a senseless waste in a world of so much need (Op. cit.). Yet Jesus reprimands Judas, not Mary. He reminds Judas and everyone else who had gathered at Lazarus’ dinner table that it will always be possible to serve the poor, but that he himself would not always be with them (Op. cit.). There are those who assert that Mary is justified in her extravagance not because care for the poor is not important, but because she had an opportunity to express her profound gratitude and deep, deep love for Jesus (Op. cit.). Our pilgrimage throughout this season of Lent is fast coming to an end. In the weeks ahead we will be preparing to celebrate Easter and events surrounding it. Our celebration will seem like an extravagance – with music and hula, embellishing our sanctuary with palm branches and Easter lilies, and exchanging lei and Easter gifts. But as Justo L. González, a Professor Emeritus of Historical Theology at Candler School of Theology at Emory University in Atlanta, Georgia points out: “All of this may be true. It may even be proper. But this is not the reason for our joyful celebrations and extravagant actions. The true justification is at another level. Mary spills her perfume in wild abandon for no other reason than this: Jesus is there. There is no calculation here, no consideration for efficiency, no sense that this is a waste. There is nothing but the sheer love and gratitude for what Jesus has done” (Op. cit.). “This does not mean that the poor are not important. On the contrary, Jesus establishes a parallel between himself and the poor. Now he is present, and Mary rightly feels the need to be extravagant. When he is no longer present in the flesh, the poor will still be [with us] – to be served with the same extravagance” (Op. cit.). I returned to Hawaiʻi in 1991 when I accepted the call to serve as the pastor of this church. Over the years, I have had the opportunity to be involved in the work of Hospice Maui, serving on its Board of Directors, participating with other religious leaders in the training and orientation of Hospice volunteers, and welcoming family and friends to Mākena each year on Memorial Day to remember and celebrate the lives of loved ones who died over the course of the previous year while under hospice care. I know that we are inclined these days to be very antiseptic in our approach to death, but the ritual of washing slows us down and compels us to take stock of the reality of death in all of our lives – whether it is a mother weeping for the death of a son; a brother for a brother; a wife for a husband; a grandson for a grandmother; a nephew for an auntie; a friend for a friend. As we slow down we become aware that each life is sacred; that each life is a gift. I remember on more than one occasion how the Hospice caregivers would gather with family to wash and apply lavender perfume to the bodies of those who had died. From that first occasion and in the other occasions that followed when the ritual was done, it became clear to me that it was an intimate - and yes - extravagant act filled with love and compassion. Jesus is no longer with us but his aloha is here, present at the table that has been set before us. As we gather to share in the eating of the bread and the sharing of the cup, we are mindful of God’s extravagant love made known to us in his birth, his life, and his death.